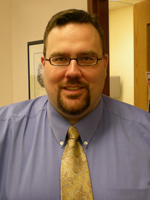 Academic Advisor, William Klewien, M.A. Greetings! My name is Bill Klewien and I am one of the five undergraduate Academic Advisors in the McAnulty College of Liberal Arts. I’m entering my fourth year as an advisor at Duquesne and I thoroughly enjoy it. I love working with my students, getting to see them grow and develop over the course of four years. 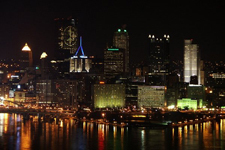 I also love Duquesne itself, the campus, the sense of community here… it’s just a neat place to be. I live in the Mt. Washington section of the city and graduated from the David B. Oliver High School. As an undergraduate, I majored in Russian and dabbled in molecular biology at the University of Pittsburgh before earning my master’s degree at Indiana University of Pennsylvania. I have a dog (that looks more like a horse, see left), his name is Mongo… and when I’m not entertaining him, I enjoy listening to music, riding my bicycle, and driving aimlessly around the area... sometimes taking pictures (see above/right). I teach two classes, UCOR 030 – Research & Information Skills Lab and CLPR 201 – Liberal Arts Seminar: Navigating “Major Terrain,” a course developed and taught with another Liberal Arts advisor, Ms. Sarah Durney. I enjoy teaching as well as having the opportunity to interact with students in a non-advising capacity. My office is located in 212 College Hall. Please feel free to stop by (even if you’re just visiting Duquesne)!